Shirt by H&M, Sweater by Topman, Jacket by Topman, Bag by BAGGU, Trousers by H&M, Plimsoll Sneakers by Urban Outfitters. My very first blog post with my style. *pops confetti* The weather here in Chicago has finally shown autumn's true colours, and it hit us pretty hard. For the past few weeks here, its been very warm. Almost too warm for autumn and suitable for summer. During this shoot with Deepayan, I was glad I could comfortably wear layers again without sweating like mad. Usually, this is my go-to outfit when I'm feeling casual/lazy. Sometimes the colours of the jumper, shirt, and trousers change of course. 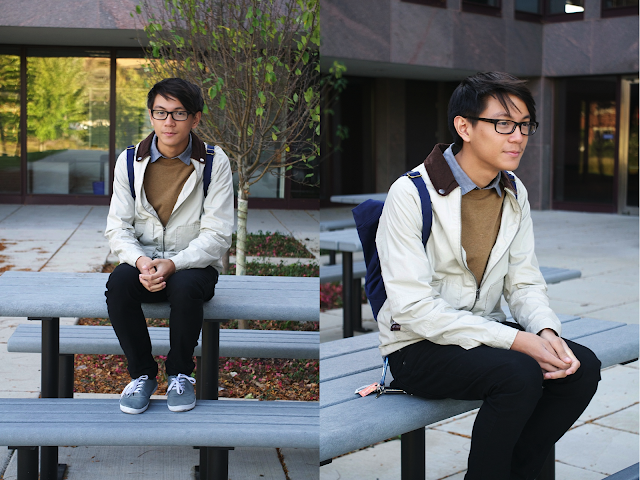 I'm glad I can bust out this and similar combinations this winter because I miss being able to dress in layers without dying in heat. Also you couldn't really tell, but I was wearing Polka-Dot socks by H&M. a bit of a break, if you will. Since I've been a bit busy with schoolwork and other matters, I probably won't be posting much for the next few days/weeks. Also that being said, I'm currently saving up spare money for a new camera; and hopefully I get this job I applied for so it'll increase my chances of starting to learn photography and post my own original photos. A blog isn't really original without original photographs right ? Time to time I'll post a few posts, so look out for those soon ! Speaking of Japanese streetstyle and fashion, I stumbled upon this video from Reebok documenting some styles of the Japanese streetstyle scene during the cherry blossom festival. Interesting video, and I was surprised by the interviewer's Japanese lingual skills. "Japan is like a toy box. Within the fashion, there are many variations." Japan is home to a wide array of different styles, from the avant-garde Visual Kei style of Harajuku to the more muted street styles shown above. 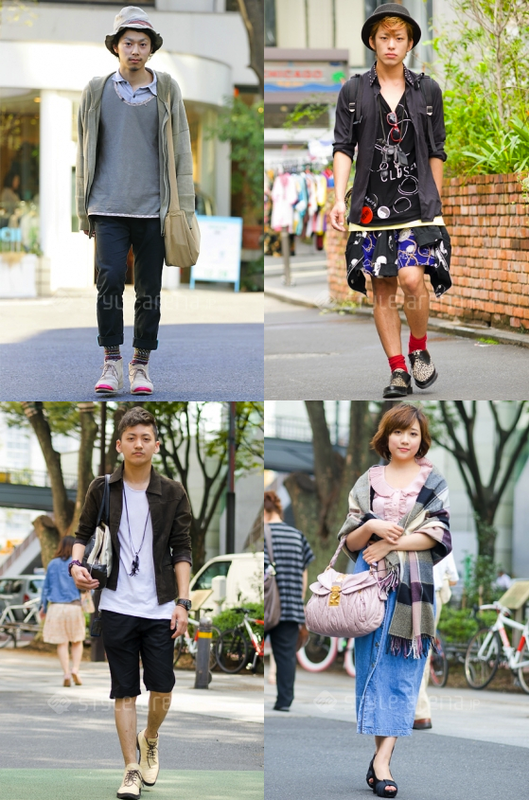 Walking around Shibuya, or Ginza; you'll see that style and fashion is ubiquitous. I'd say more ubiquitous than here in the US. Japan will always be on my list for one of the most stylish countries as a whole, and I can't wait to possibly visit again this summer. I simply cannot stop perusing through these street-style shots. 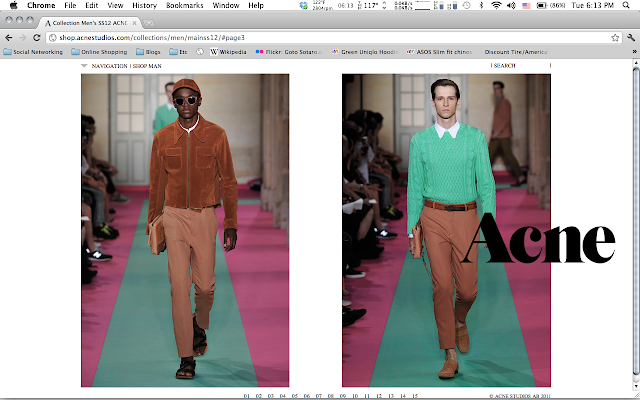 acne's re-designed website is now up ! Screenshot taken at acne website. Fashion house/brand ACNE has re-launched their website with a much simpler and more minimalistic modern feel than the past layout with the red-shade colour all around. Personally, I love the aesthetic of this new layout because of the very simple presentation and ease of access when shopping. Also the Acne logo shown in this screen shot above the 2nd model shot stays throughout all the pages you navigate to, concrete in it's position. If you haven't yet, I suggest taking a look around their new online site and check out their new collections and garments up for sale ! 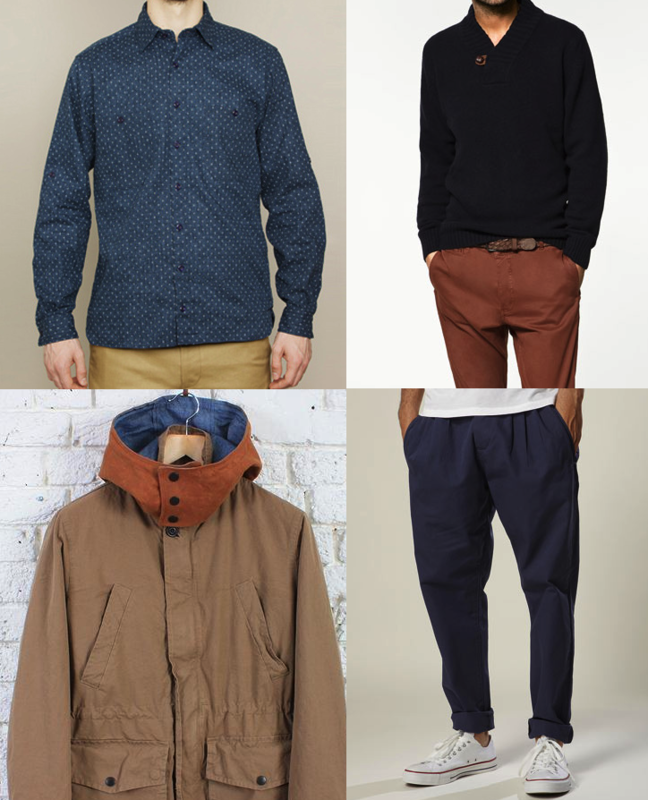 From top left: Freemans Sporting Club, Zara, Albam Clothing, Topman. Some of my findings and favorites from perusing around online shops. The darker, and neutral palette of any of these pieces are perfect for this coming autumn/winter weather. Particularly, I'm in love with the detailing of the Albam brown jacket. Definitely considering investing in one this season. 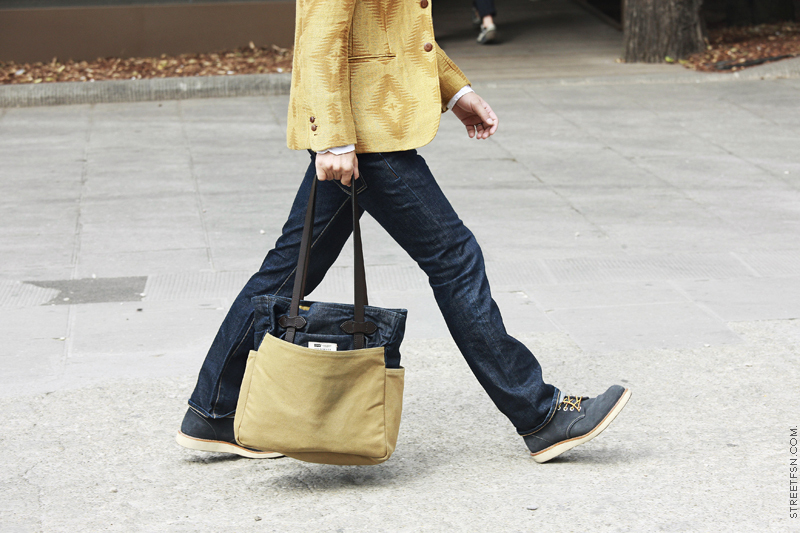 In my opinion, a bag is one of those accessories that can easily tie an outfit together. 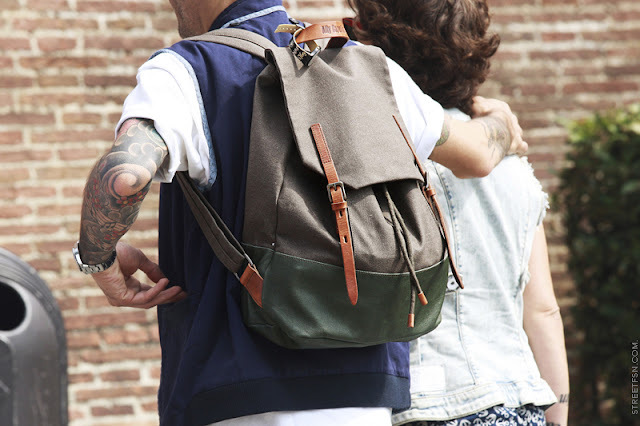 Usually backpacks and bags are overlooked by some, which is understandable since they add more weight and can be more of a bother. But the many varieties and styles of bags is what keeps me and many others interested. 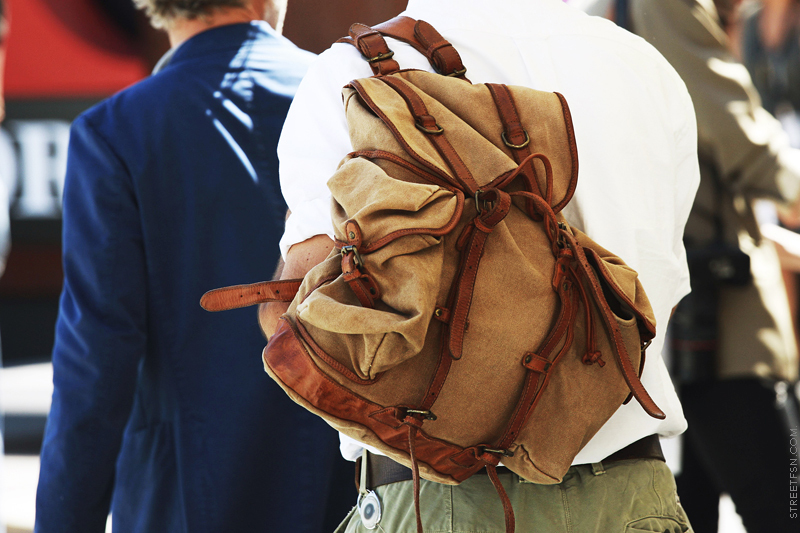 The most sought-after bags are usually of the rucksack or satchel style, which mostly provides an earthy and rustic feel. 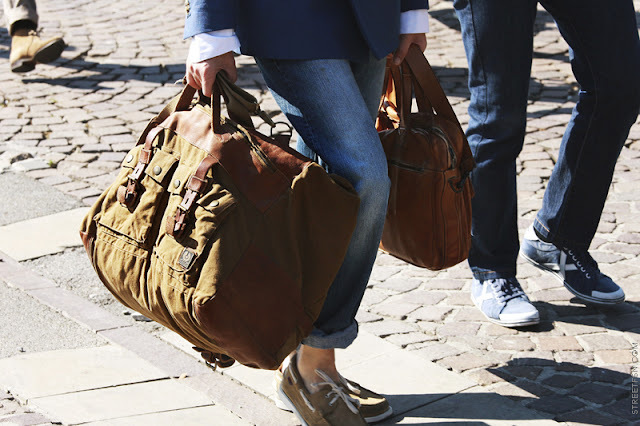 Looking through STREETFSN, I saw the post all about menswear bags; and I couldn't help but post some of my favorites from the photo-collection.